Let's clean up our waterways! Let's celebrate Earth Day by going outside and cleaning up our scenic waterways. 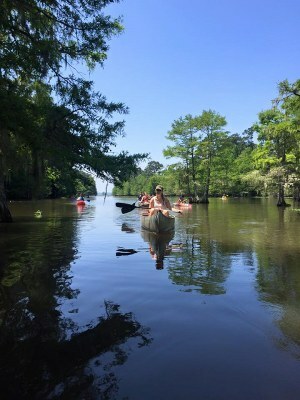 This trip includes basic canoe instruction and allows you to discover why our park is a wonderful paddling destination. *1 ticket is for 1 canoe. 2 adults fit in 1 canoe. 1 child can sit criss-cross in the middle and two very small children can fit in the middle. *IF YOU CANNOT COME YOU NEED TO CANCELVIA EVENTBRITE. The same website that you register with will allow you to easily cancel without having to call in. If you do not cancel and do not show up for the trip your name will be put on a waitlist for all future canoe trips; you will not get first chance at the trip. Where to Meet: Meet at the Walnut Ridge day use area where the canoes are located. Park permit in your windshield (received from park headquarters or self-pay station - pay with cash at the self-pay station, $4 per person, children 12 and under are free). Full water bottle or similar beverages to keep you hydrated. Close-toed shoes, secure water shoes or old tennis shoes that you don't mind getting wet (flip-flops are not recommended). A hat that won't blow away in high winds. Dry bag, zip lock bags, or waterproof containers for your gear (We are not responsible for any damages to your possessions). Something soft such as a cushion or towel to sit on. If your hands are not conditioned to paddling consider bringing gloves to help avoid blisters. For litter clean-up: Trash bags, gloves, trash pickers, a knife or scissors for cutting fishing line. Be prepared to be out on the water for 2hrs. Please use the bathroom before showing up at the launch site. There are no bathrooms at the launch site. Canoes, paddles, and life jackets are provided by Martin Dies, Jr. State Park. Children 12 years old and younger must wear their life jacket, it is the law. Participants must be able to carry a 60 Ib canoe to the water. Visitors with their own canoes and kayaks are welcome to join. Introduce yourself to the guide, let them know that you have your own boat and that you are not on their list. There is no fee for attending this program; however, payment of park entrance fees are required. Entrance fees are paid at Park Headquarters or the self-pay stations and are $4 per person over the age of 13, children 12 and under are free. This program is subject to cancellation in the event of inclement weather. Unfortunately, we are unable to reschedule canceled programs.